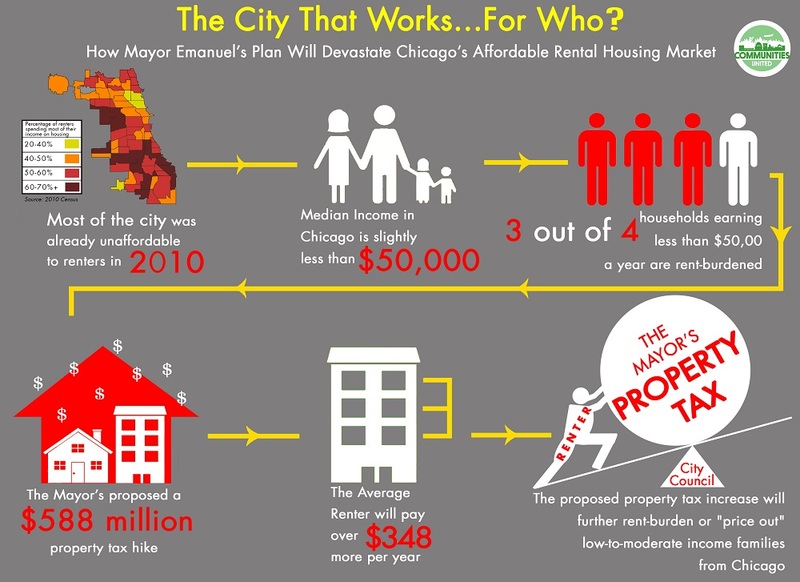 A study by the Northwest Side coalition Communities United finds that tenants of two- to four-flat buildings will experience the greatest rent hikes under the mayor’s property tax plan. Residents, landlords and community organizers are warning that Mayor Rahm Emanuel’s property tax hike will accelerate gentrification on Chicago’s Northwest side. The City Council overwhelmingly approved the mayor’s budget on Wednesday, including the $543 million property tax increase slated for police and fire pensions. An analysis of Census data by the coalition group Communities United concludes that the higher assessments will drive low-income renters out of Albany Park, Belmont Cragin and Lincoln Square, because building owners will most likely pass the additional cost on to their tenants. “Renters will be pushed out of their homes, and Chicago’s Northwest side will continue to become a place that is only accessible to those who have very deep pockets,” said Alderman Carlos Ramirez-Rosa (35th). According to the study, the pinch will be felt most acutely by tenants of small, multi-unit buildings, which comprise roughly one-third of the city’s rental housing stock. “Rents in these two- to four-flats could go up as much as $50 to $100 a month,” said Diane Limas, board chair of Communities United. For instance, a two-flat in Lincoln Square with an assessed value of $527,940 would see a tax hike of $1,240. The coalition asserts that could amount to an annual $620 increase in rent per unit. Beyond the northwest side, Limas said it’s time for city officials to consider that nearly 40 percent of renters throughout Chicago pay more than one-third of their income on rent, and would therefore be considered cost-burdened by their housing. “Three out of four working families that rent their apartments in Chicago, earning less than $50,000 a year, are already paying too much for housing,” said Limas. She added that a property tax increase would likely further expand that pool of cost-burdened renters, and called on the mayor to convene a task force to examine the issue.